Some people have wine journals. Liz James told me about beer journals. Mine will double as a travel journal. More than wine, when I travel, I find beer. Not haute beer. Everyman beer. Beer I can order in any restaurant. And these stories are not the stories of the most amazing places I’ve seen. They are about the times when I had a beer, and the people I was with. These are our local watering holes. Here is Lewis at the The Friendly Spot, which has apparently been around longer than I thought. It can be hard to find a seat, but when you do, it’s about as simple a place as ever did grace the hip side of town. And it is oh so hip.That’s why my bike helmet it here. Because we’re trying to be hip like the Southtowners. 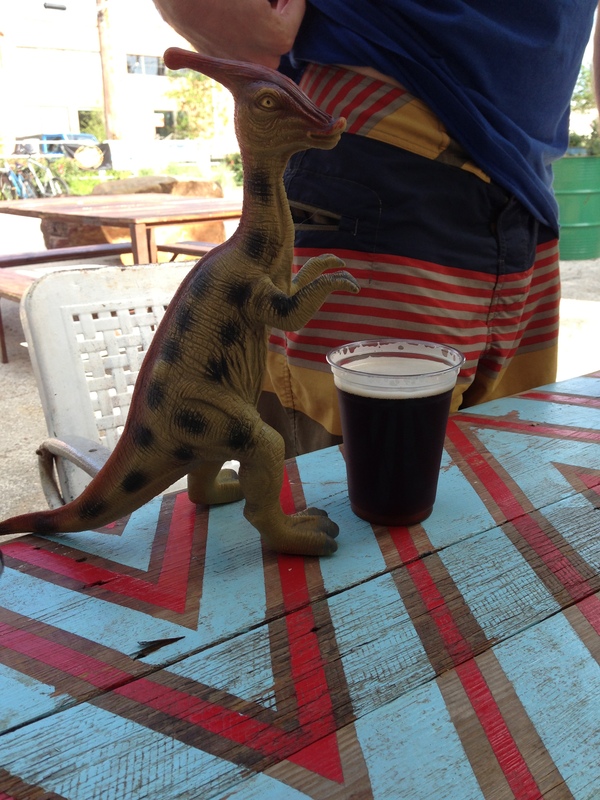 We often meet our Southtown friends there. I was particularly thrilled to see it mentioned in the biography of Ann Richards. The brewmaster at The Granary went to high school with my sister, and the beer is worth a mention. The Root Beer is worth some sort of award.This flight of beers was shared with a group of Australian travel professionals visiting for a conference. More proof that Australians know how to have a good time. The Granary is not a bar. It’s a restaurant, serving an elevated twist on Texas smoked meets and their accouterments. I, for one, am not a die-hard purist about Texas beer and bbq. People rail about the inherent evils of “high end” bbq and beer flights, but this is good food and good beer. What could be more purist than that? There’s not any beer in the is picture, but Esquire Tavern is simultaneously 1) home to the longest bar in Texas, and 2) the only place downtowners go on the Riverwalk. History and relevance. Some other organizations I know of should take note. The food is all heavy duty, and the drinks are delicious. I’ve had more than one beer here. On the night this picture was taken, I was with Liz James. We had just left a jazz concert and the Spurs were in the final round of the NBA championship. Liz is committing the crime of getting us to be very attached to her before she leaves us (probably for Boulder, like everyone else). But we’ll forgive her and have a few more beers before she’s gone. We can reach The Luxury on our bikes, without peddling. We can leave our home, lift our feet, and roll the 7 blocks to this table right here. 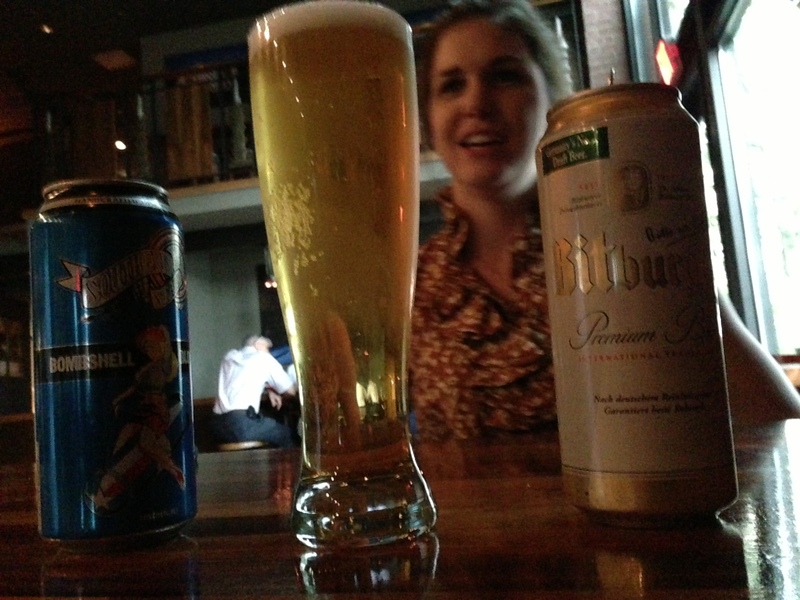 You know the beer in the picture is not actually mine because it’s opaque. All seating is outside, and I love it. Large plastic animal toys substitute for numbers. In this picture, we are with our friends, the Sedgwicks who pointed out that Lewis’s pants match the saurolophus and the table. It’s cool to have people around who notice that sort of thing.